If you ask the people who know Fabiano Caruana what Fabiano Caruana is like, they will tell you that Fabiano Caruana is, you know, just a normal guy. He likes movies. He likes music. He likes to eat. He works out. He goes on dates. Just a normal guy who is ranked second in the world in chess. A normal guy who was pulled out of school after seventh grade to do nothing but play the ancient and intricate game. A normal guy who is a hairbreadth away from prying the No. 1 position loose from probably the best player ever to play the game. A normal guy who, beginning Friday, will sit down at a table in London with this probably-the-best-ever player, Magnus Carlsen of Norway, in a grueling, weeks-long battle for the world championship of chess. A normal guy who could be the first American to win the title since Bobby Fischer in 1972. Real 99.99999999th percentile stuff. If you search the archives for Caruana, one of his earliest mentions you’ll find is a television news segment from early 2001, when he was 8 years old and living in Brooklyn. “Here’s the story of a boy who could be the next Bobby Fischer,” the host says. Caruana’s mother, Santina, describes her son’s play as art (“I just — I can’t take my eyes off him”); his coach describes him as “mentally quite tough;” and a chess club manager says he’s sure to become a grandmaster and possibly world champion. Caruana, age 10, takes on 15 challengers simultaneously in Manhattan. He didn’t lose a single game. Another early appearance was in 2002 in the New York Daily News. That story featured a photo of a 10-year-old Caruana in an oversized T-shirt staring at a chessboard and grasping a bishop. He was taking on 15 opponents simultaneously in Bryant Park in Manhattan. He didn’t lose a single game. 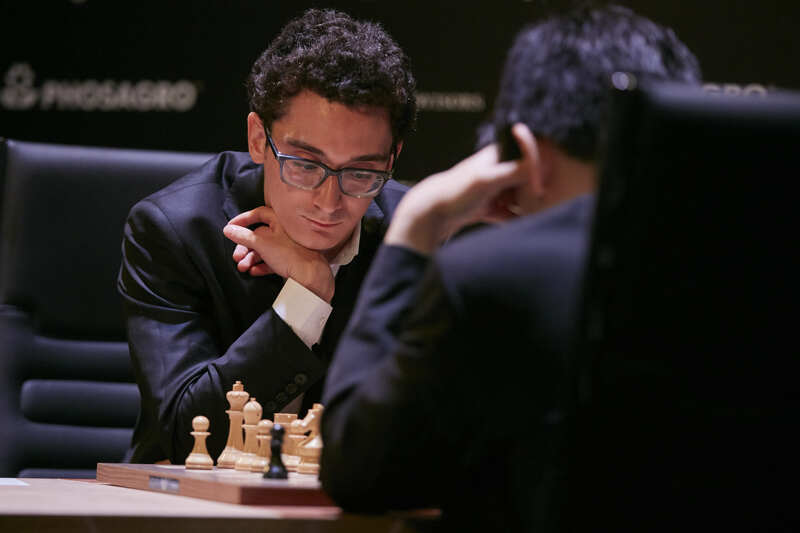 When you look at stories like those, Caruana’s championship bid seems preordained, the unavoidable result of an intense, prodigious and celebrated chess upbringing. But another quick search of the archives turns up dozens of other names that have also had their chess picture in the paper, and have also been teased by the press as The Next Bobby Fischer: Josh Waitzkin, Carissa Yip, Hikaru Nakamura, Eric Hicks, Jorge Zamora, Michael Wilder, Steven Zierk, Robert Lau, Gata Kamsky, Vinay Bhat, Ray Robson, Jordy Mont-Reynaud, Alan Tsoi, David Newmuis, Jeff Sarwer, Kayden Troff, Sam Sevian, etc., etc. You almost certainly haven’t heard of most — or any — of these people. None of them has played for the world championship of chess. Caruana will. Caruana himself is a hard person to reach these days. After initially agreeing to provide FiveThirtyEight access to pre-championship training sessions, Caruana’s managers (he has two) declined to make him available for an interview. So instead I turned to his father, Lou. It all started with some squirming Lou told me. Caruana was just a normal kid. The person who ran Fabiano’s after-school chess program in Brooklyn made what was, in retrospect, perhaps the most important phone call in recent U.S. chess history, informing his parents that Fabiano exhibited a remarkable amount of talent for someone of such a young age. Fabiano’s first tournament was soon after, in May 1998, in Queens. After that, he played every day. He played nights and weekends. He got even better. After six months, his dad stood no chance against him. So they turned to a mentor. I met Miron Sher, a Russian-born grandmaster, in the predominantly Russian neighborhood of Brighton Beach in Brooklyn, where he has lived for the past decade. He carried a chess magazine featuring Caruana and Carlsen on its cover, so that I’d recognize him. Sher was Caruana’s chess coach for “four years and 10 months, before he left to Spain.” Those were formative years, which saw Caruana’s U.S. Chess Federation rating climb from 1300 (a player in the dubiously named “fourth category”) to 2305 (a “life master”). Sher remembered those exact numbers correctly. We sat on a bench at the boardwalk, talking over crashing waves, staring at an ocean that stretches to the lands where Caruana came of age. “Fabiano does not think about a life without chess,” he said. 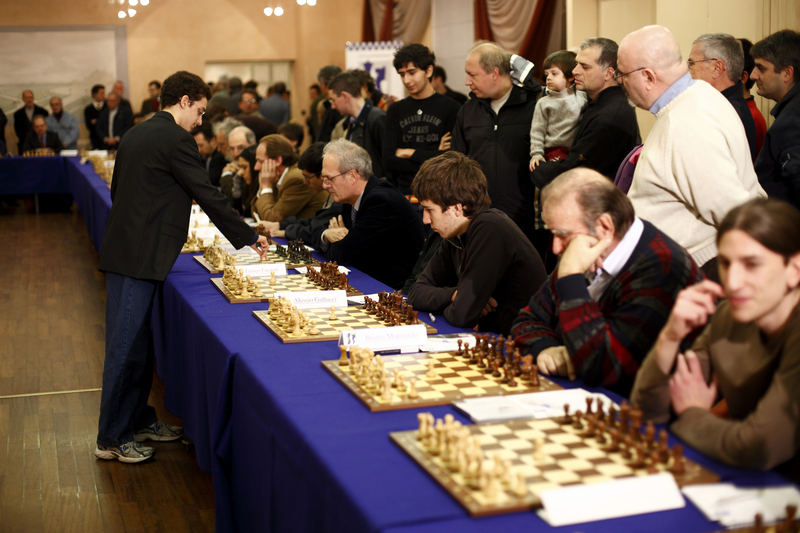 Caruana makes his move during an event with the Turinese Chess Club in 2008. Caruana became a grandmaster at the age of 14. In 2004, when Fabiano was 12, the Caruana family decamped for Europe. The tournaments were stronger, the competition was tougher, and the top coaches were in greater supply. Caruana flew up the ranks. He became an international master in 2006. He became a grandmaster in 2007. He entered the world’s top 100 in 2008 and has never left. In 2015 he was lured back to the United States. He became No. 2 in the world — one match away from the pinnacle of his game. And now, he’s just a normal guy. I joined Yuanling Yuan, a top Canadian women’s player with a degree in economics from Yale, in a Manhattan cafe. Caruana and Yuan met at (where else?) an international chess tournament in 2016. He’s a normal guy. He’s got friends. I asked Yuan for her best Fabiano Stories — what anecdotes encapsulate this normal guy? “Let me get a moment to collect my thoughts,” she said. Over the next half-hour, a handful of anecdotes, telling or not, emerged. One, he often orders healthy food. Two, he’s ridden on and enjoyed roller coasters. Three, he loves the game Plants vs. Zombies — “It’s his nightly ritual.” Four, he yells and screams when he plays certain strategy card games. And five, if chess doesn’t work out, he’d become a bean farmer. (Or least that’s the running joke, given the purported etymology of his first name.) In other words, he’d be a normal guy. Chess is a one-on-one game with a vaguely militaristic theme, which also makes it a game of rivalries: Fischer-Spassky, Kasparov-Karpov and, perhaps, Caruana-Carlsen. Add one more: Man-Machine. The battle between human chess players and their artificial intelligence counterparts is a defining one of the modern era. But it’s a battle that the machines have already won. With the proper app installed, my iPhone would easily become the 2018 world chess champion. Caruana, left, and Wesley So, the top American grandmasters, play in the Candidates Tournament in Berlin this past March. Caruana won the tournament, which sent him to the world championship. It’s also the move the computer recommends. Just a normal guy with quirks and idiosyncratic preferences. A guy, for example, who favors the Petrov defense. “Frankly, the Petrov is what I think about when I think of Fabi, since that’s ‘his’ opening,” Hess said. “He’s found a way to not just try to equalize with it, but also play for more than just equality.” That opening — in which Caruana has the black pieces and mirrors the white pieces’ first two moves — looks like this and was exhibited to great effect in a game from this year’s Candidates Tournament, which sent Caruana to the world championship. Running on my laptop, Stockfish, the powerful chess engine, assesses black — Caruana, in this case — with about a half-pawn disadvantage after the first two moves. Nevertheless, Caruana won the game. Caruana has toiled for most of his normal life in a game that is abnormal. Chess is a complex forest of strategies and tactics that at its most elite levels is unnavigable to the rest of us. And here’s where the argument for Caruana’s normalcy, his relatability, starts to crack. Sure, he likes food and movies, just like me or you. But his skills are so elevated that they are not visible with the naked eye. What he does is abnormal. Chess is best experienced through metaphor — and not only because it’s so complex. Basketball, for example, is also incredibly complex yet readily enjoyable without context. The real reason is aesthetic. I can tell — immediately and innately — when LeBron James does something rare and amazing on the basketball court. I can tell simply because I’m a human being. I cannot tell — immediately or innately — when Caruana does something rare and amazing on a chessboard. Often, I cannot even tell when I’m supposed to be able to tell this. Neither, in many cases, can grandmaster match commentators, hired to shed light for us patzers. Caruana and Carlsen breathe such rarefied air that no one, except themselves and maybe five other humans, can truly appreciate what they do. It must be lonely. Chess has been unquestionably popular in the United States exactly once: in 1972, when Fischer beat the Soviets. But Caruana’s camp does not seem eager to try to re-create the phenomenon, or to reinfect the population with Fischer Fever. It’s a short journey geographically from one grandmaster’s old stomping grounds to the other’s — barely more than a mile from Fischer’s old apartment to the synagogue where Caruana learned the game — but a far lengthier one culturally and psychologically. To capture public attention and dollars, elite chess matches, with their impenetrably complex abstraction and faint military theme — knights, castles, capturing and so forth — must take place in front of a relevant geopolitical backdrop. Chess needs a war. And Fischer had one. When Fischer played Spassky for the title in Reykjavik in 1972, the match was superconcentrated with American-Soviet implications: a lone, swashbuckling Yankee genius battling the hegemonic Soviet chess machine. Where is Caruana’s war? Diplomatic relations between the U.S. and Norway have been sunny since about 1776. But the result of no conflict is no interest, and the result of no interest is no money, and the result of no money is no interest, and so on. Fischer, according to popular accounts after he won the title, was more recognizable than anyone save Jesus Christ. Fischer also turned out to be a monster — a virulent anti-Semite who praised the terrorist attacks on 9/11. Despite Lou’s nonchalance about the inevitable comparisons, competitive chess in America can escape neither the bright glare of Fischer the sublime artist nor the cold shadow of Fischer the paranoid, racist conspiracy theorist. In his prime, Fischer fired a powerful flare, and its bright light drew massive public attention. Caruana, even if he wins, may not have the candlepower. He may not rival Jesus Christ for name recognition. But maybe that’s OK. Maybe that’s what makes him just a normal guy after all. A normal guy alone, hiking deep in the forest. Here’s a chess story, in the form of an old Buddhist legend. A shepherd is tending his flock on the boundless steppe. After countless miles of wandering, he happens upon two gods who had descended to Earth. The gods were sitting on rocks, playing chess. The shepherd is, needless to say, rapt by this scene and stops to watch the game. The gods, undisturbed, ponder and move their pieces while the shepherd stands, transfixed. The gods move; the shepherd watches. Eventually, the game ends and the gods ascend to heaven. The shepherd snaps to and wearily rubs his eyes. He looks down to find that his clothes have deteriorated to ash, his wooden crook has crumbled, his sheep are long dead and he has aged into a decrepit old man. Here’s an old Caruana family legend. While traveling in Europe, years ago, Caruana and his parents boarded a plane — one of many planes that he’s boarded in his young life. Once seated, he immediately pulled out a little chess set and began to play the game that has come to define him. The plane taxied and accelerated and took to the sky, cruising high above the earth at hundreds of miles an hour toward their destination. A rapt and oblivious Caruana kept playing, transfixed. Eventually he looked up, turned to his father and asked him a question. FiveThirtyEight will be covering the world chess championship match, which begins Friday, here and on Twitter.